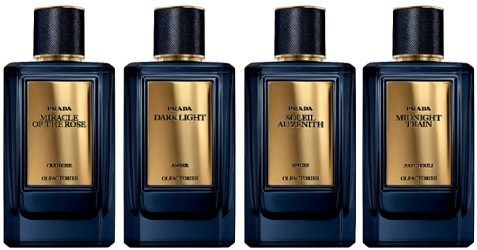 Prada has introduced the Prada Mirages, four new fragrances in the Prada Olfactories luxury range: Miracle of the Rose, Dark Light, Soleil au Zenith and Midnight Train. The latest addition to Prada’s Olfactories collection, Mirages are luxurious, potent concoctions inspired by the Orient. Miracle of the Rose (Oud Rose) ~ "Miracle of the Rose surrounds the elegant flower with an almost unfathomable depth, with the delicate yet potent notes of rose absolute and patchouli. There is a deep architectural sensation – a physical volume of leather, agarwood, and tobacco – layers that build for decades, centuries." Dark Light (Amber) ~ "Transposing the warmth of amber with the cool cleanliness of aldehydes, Dark Light both defines and defies the orientalist fantasy. The components are older than memory: musk, real Madagascan vanilla, myrrh, angelique." Soleil au Zenith (Spices) ~ "Soleil au Zenith combines innocently sweet ylang-ylang and peach traversed with sophisticated essences of sandalwood built on a deep, dark base of vanilla, nutmeg, cinnamon, pimento, and cumin." Midnight Train (Patchouli) ~ "A worldwide exclusive, Midnight Train is a mix of memories accented by scents that have come in from distant aromatic cities: sweet Texan cedarwood, woody Andalusian citrus, and Indonesian patchouli swirling around a bright, warm Amber accord." Prada Mirages Miracle of the Rose, Dark Light, Soleil au Zenith and Midnight Train are available now at Selfridges in the UK, £195 each for 100 ml Eau de Parfum. Oh good. I was just telling my boyfriend around the breakfast table that there was a shocking dearth of fragrance lines inspired by the Orient. I know, right? To say nothing of oud rose perfumes. I’m not even sure what oud is. Can you list a fragrance or two that has this mystery note? My first thought was, really? more from Prada? They’re going nuts with the scents these days. OH my gawd, more is more it seems with Prada. At least these are cheaper than the original collection. I bet these don’t come with a Prada cloth pouch! Oh, if there’s no pouch I’m out. Aha — see update above! Well, have to wait to see if I like the prints, right? “Layers that build for decades, centuries.” Talk about staying power! I’d hate for these to be good since there is no way I can afford them. The spicy one sounds interesting to me. I really like spicy perfumes, but I have noticed I don’t seem to have many that actually have spices other than vanilla and pepper in them. Maybe the Amber, too. They are definitely operating under the “More is Better” mantra. And one is exclusive — worldwide!! Darn, I was hoping to pick up a bottle on the space station duty free. The samples are huge 4mL splashes just like the ones for the Hermessences (although the samples now come in generous atomizers). Saks was giving them away like candy at Halloween. I wonder what that’s all about? I have to assume it’s some kind of marketing angle? Can only say that these names are in keeping with the original Olfactories — mix of English and French. But also — Poison Girl? Modern Princess? A Mirage, isnt that a false image? A sort of optical illusion.